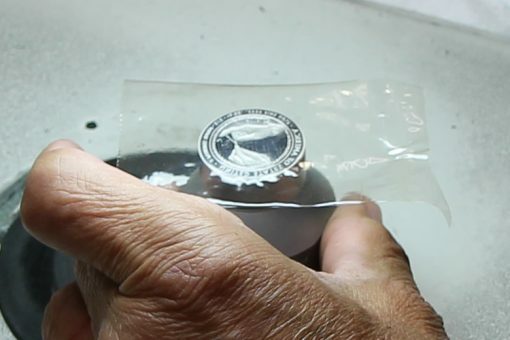 This seventh article about our visit to the U.S. Mint at Philadelphia describes how proof dies are polished for the striking of collector coins. 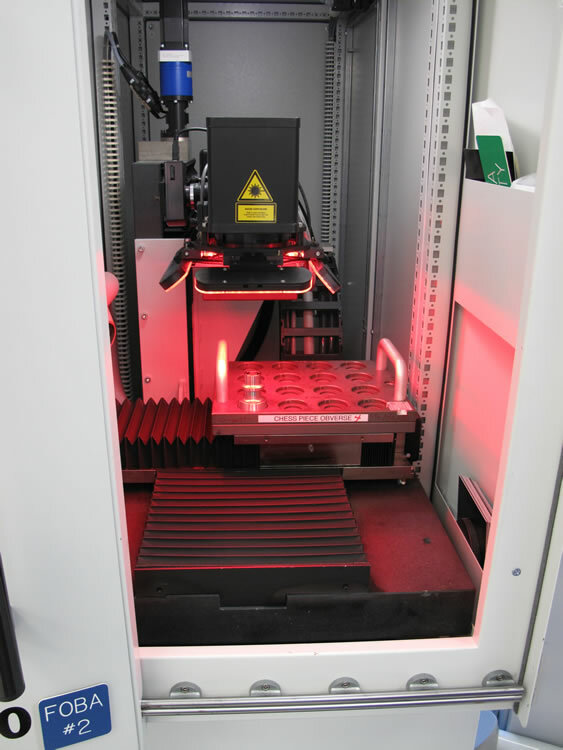 Technology plays a huge role in producing coins at all United States Mint facilities. It’s complimented with a group of people dedicated to make it all happen, with some of them adding their own personal touch to the process. Enter Alberto Morell, one of the Philadelphia Mint’s buffer-polishers. He manually polishes dies that are used in the making of proof coins for collectors. Buffer-Polisher Alberto Morell polishes a die. What are coin dies? They’re pieces of steel that bear negative designs of the coins to be produced. Placed in high-tonnage presses, an obverse and reverse die stamp their designs onto a metal disc (planchet) and it becomes a coin. 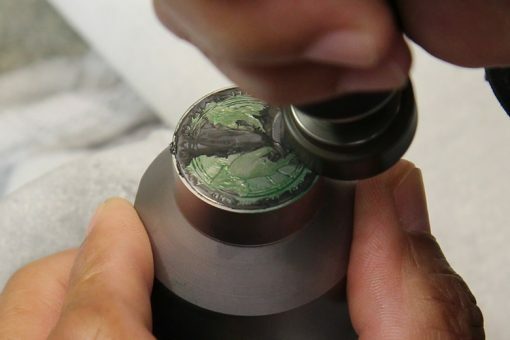 Learn how the Philadelphia Mint makes dies. Here, a reverse die for the Ida McKinley First Spouse Gold Proof Coin and an obverse die for the Helen Taft First Spouse Gold Proof Coin are about to go through polishing steps at the Philadelphia Mint. 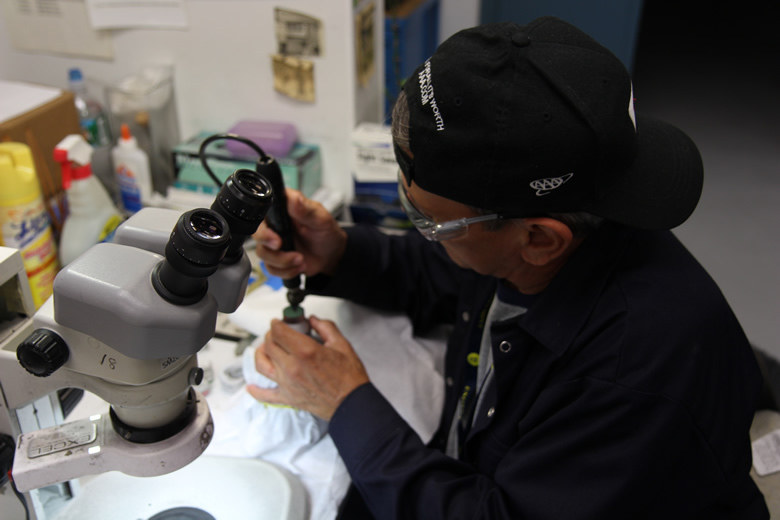 Using clear tape, an X-Acto knife, microscope, diamond dust compound and rotary tools, Alberto showed us how proof dies are manually polished so they can press planchets into proof coins. Proof coins are not made to spend and they don’t enter circulation. They are struck for collectors or to commemorate a person, place or event. Proof coins are the super shiny ones with raised frosted designs (devices) and mirror-like backgrounds (fields). To achieve that frosted look, the entire surface of the proof die is sandblasted. This is accomplished when a high pressure sandblasting machine swirls a mixture of glass beading and aluminum oxide around the die. Here, a front view of a Zero Blast-N-Peen machine that is used in sandblasting proof dies. Another view. The bottom right shows how the die looks inside the machine as its gets sandblasted. Next, the mirror-like aspects are achieved through polishing. It was most interesting to see how it all unfolds. First, a piece of clear tape is placed on the face of the die. Then, with the aid of a microscope, an X-Acto knife is used to cut the tape from around the design elements and expose the flat background. 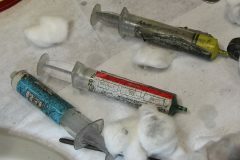 Tape is used to hand-mask the die’s design elements. This particular die has been polished twice, with another, final round pending. Here, Alberto begins to cut away the tape and expose the flat surface, which will be the coin’s background. Now, it’s just a matter of using three varying grades of paste-like diamond dust and rotary tools to achieve the mirror-like affect. Three different grits of diamond dust are used in polishing dies. 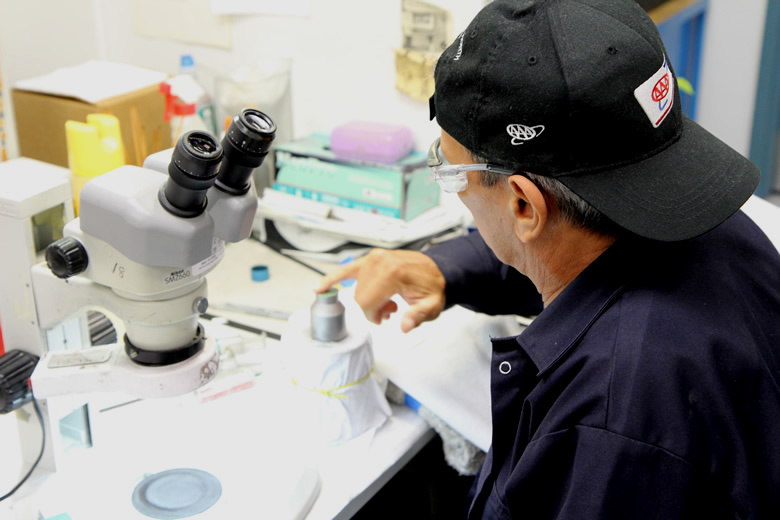 Alberto applying diamond dust compound to a proof die. 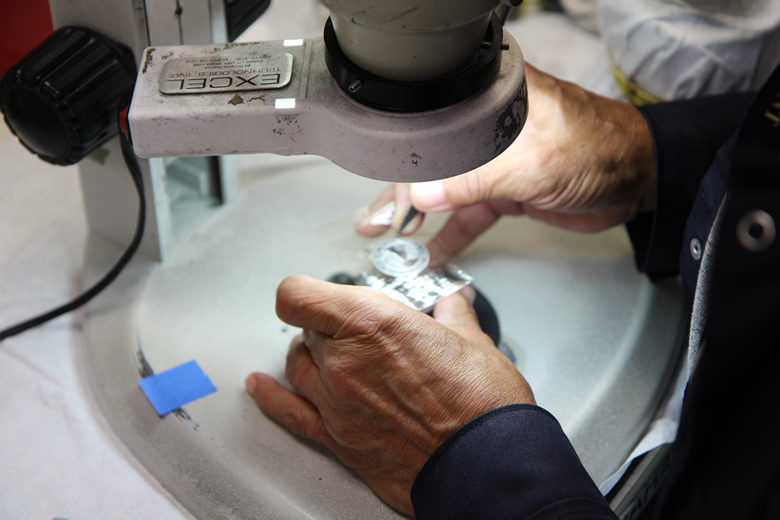 A grade of the diamond dust is added to the die by hand, and the polishing begins through the abrasive contact of the compound and rotary tip. A die with diamond dust compound applied is polished with the aid of a rotary tool. The polishing of this die is nearly completed. The entire process is repeated for each grade of diamond dust until the final mirror-like finish is achieved. 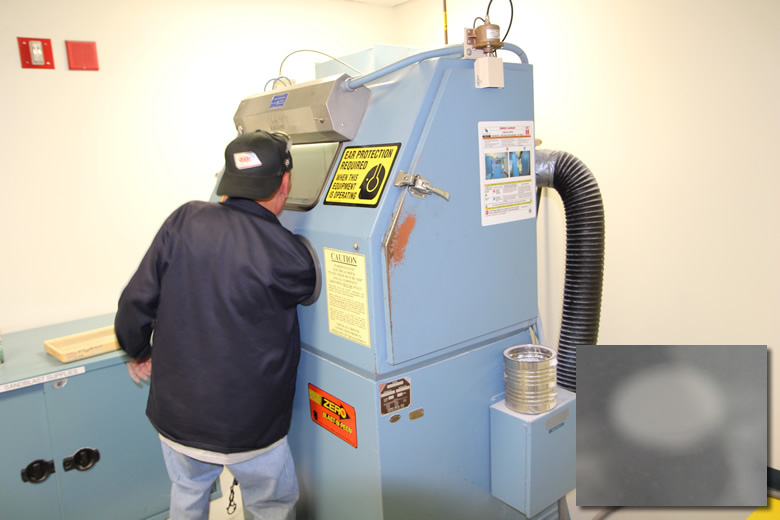 Depending on the complexity of the design, the polishing process can take about 1 to 3 hours. Going forward, proof dies are placed inside a Physical Vapor Deposition (PVD) chamber. The PVD process chromes the face of the die to strengthen and extend its life. (The PVD chamber was talked about in this San Francisco Mint article.) 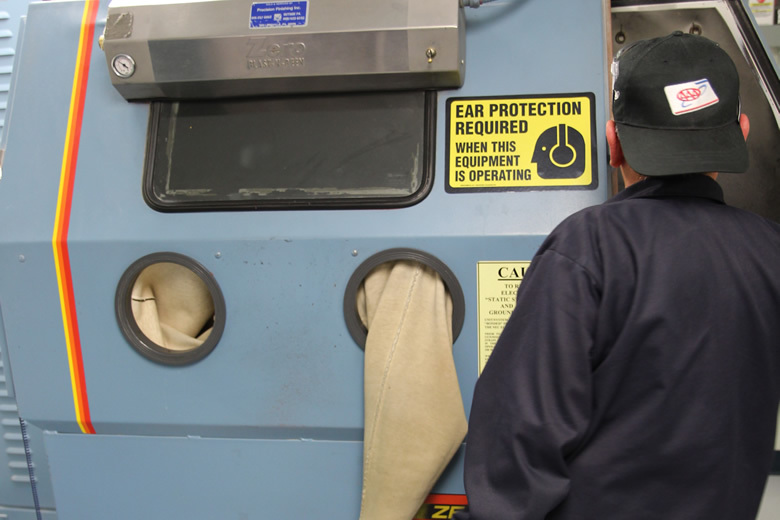 When completed, the dies are ready for use in presses to strike proof coins. 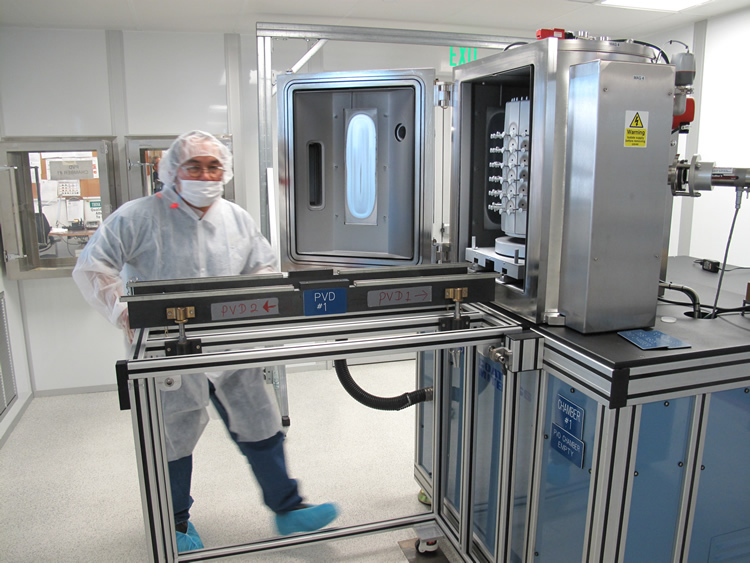 Robert Nyein preparing Physical Vapor Deposition (PVD) Chamber in Clean Room at the San Francisco Mint back in February. The PVD Chamber is an environmentally safe method to chrome plate dies which extends their usage. 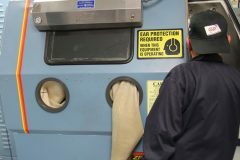 Before entering the area, you dawn disposable garments in a vented room to control contaminants. The above methods are not applied on all coin dies. Varying levels of die technology come into play based on the intended use. 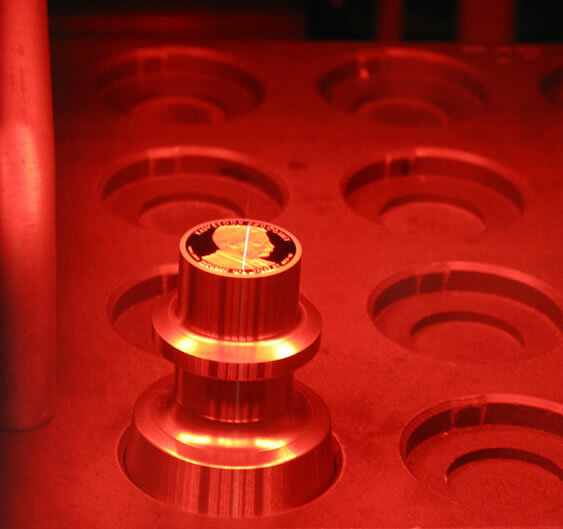 For example, at the San Francisco Mint which produces tens of millions of proof coins each year, dies are placed in a machine for laser frosting after they polished. This laser engraving machine at the San Francisco Mint is used to apply frost to achieve cameo appearance on proof coins. 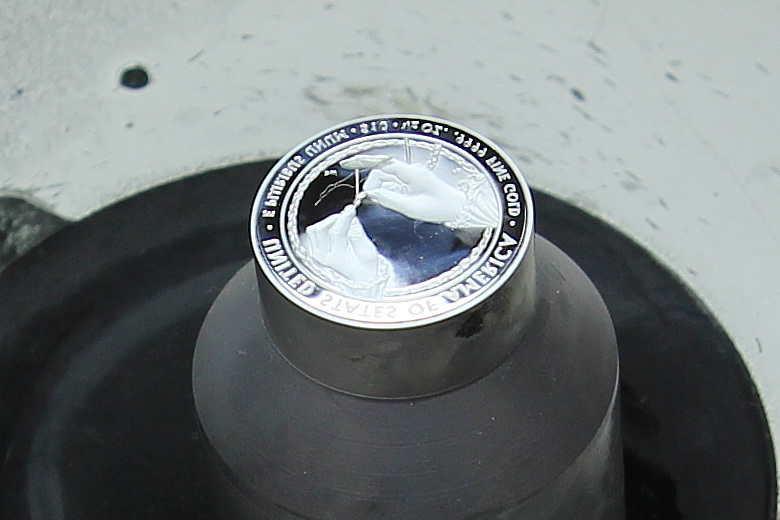 Here, a die for the 2013 Theodore Roosevelt Presidential $1 Proof Coin is being laser engraved. 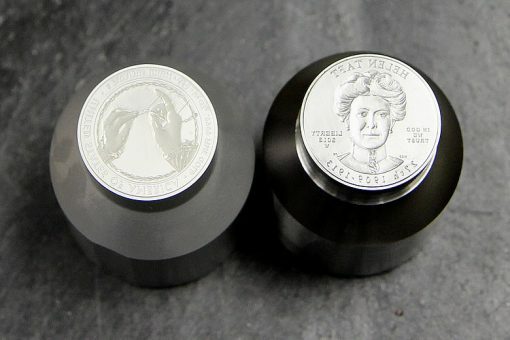 Also, and developed at the Philadelphia Mint, there are new polishing and laser frosting techniques that were introduced just this year and used on dies for the 2013-P Proof 5-Star Generals Silver Dollar, the 2013-W Enhanced Uncirculated American Silver Eagle and the 2013-W Proof Platinum American Eagle. That’s it for this article. We’d like to thank Alberto Morell for his time and, as always, thank you for visiting CoinNews.net. Return Monday, October 7, for the last article in our series about the Philadelphia Mint. It offers final comments and includes all of the photos we’ve published. Links to past articles in the series are found in the upper right of this page, directly below the Google map of the facility. Another great article mike! Thank you! There is a grammatical error on para 3, line 4 “or to commemorative a person”, the correct usage I thought was “to commemorate a person”. But again, these articles are super useful for novice like me and am very very appreciative of your efforts. Thank you Wdg5. I corrected the wording. Which diamond cut compound do you use to polish, and where can I buy the polishing kit? Closed Federal Holidays except as noted below. July 4 9 a.m. to 4:30 p.m.
For complete tour information, also call 215-408-0112, 24-hours a day.